Hi everyone! Today I have a new A England polish to show you. Whispering Waves is one of two new additions to the Heavenly Quotes collection (along with Sparks Divine). Whispering Waves is a gorgeous holographic turquoise with a strong pink/purple flash. I love this type of colour on me and the pink/purple touch to it is just so pretty. I used 2 coats plus topcoat. I apologise in advance for the picture heavy post but this polish is just so gorgeous and I had a hard time narrowing down my photos! The formula was perhaps a little thicker than some of my other A England polishes but it was almost a one-coater for me and still lovely to apply. I decided to add some subtle stamping using another A England polish, Crown of Thistles. This colour goes so well with Whispering Waves. I used a flower design from the Moyou Pro 06 plate. Crown of Thistles stamps so perfectly. The stamping turned out even more subtle than I had imagined but I liked the result anyway and enjoyed this as my full mani for a few days! So this is my purple mani for Angie. I chose to wear Defying Gravity by Girly Bits Cosmetics. This shade was created in collaboration with Phyrra and Pam describes it as a 'gorgeous bright purple, loaded with turquoise shimmer and a sprinkling of holographic sparkle'. It really is stunning. I used 2 coats of Defying Gravity and one coat of topcoat to finish. The shimmer is so amazing in this. It is probably one of the strongest shimmers I have ever seen and I absolutely love it. The formula and application were perfection. So that's it! What do you think of this polish? 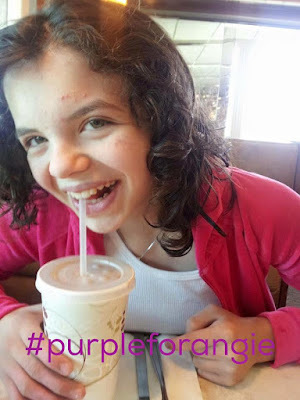 Check out the hashtag #purpleforangie to see the other purple manis for this lovely little girl! Hi everyone! Today I have a bit of nail art for you. The new Paint Box Polish Knight Bus collection (see swatches here) inspired me to do some Knight Bus nail art! I started out this mani with 2 coats of The Knight Bus then used black and white acrylic paints and a fine detail brush for the design. I like the black and white against the vivid purple, like silhouettes at night time. My favourite part of this scene is when the little old lady is crossing the road, forcing the Knight Bus to stop very quickly. I love the countdown until they can speed away again! So I decided to paint the Knight Bus and the little old lady at 12 'o' clock! I like how this design turned out, it's not too bad for a quick freehand one. I mostly like the colour combo though. What do you think of it? The Knight Bus Collection will be released at noon EST on November 7th. Pam has generously made a discount code for me to share with you! Enter the code THEMANICAFE for 15% off your order! I also wanted to remind you again about the new fan group on Facebook called Paint Box Mani Mafia (which I co-admin). We’d love to have you join if you haven’t already! Hi everyone! 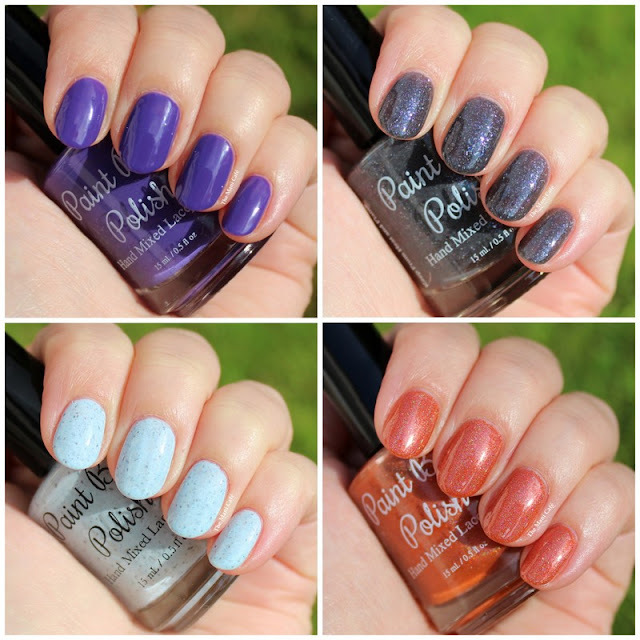 Today I have a new collection from Paint Box Polish to show you! This is The Knight Bus collection inspired by the Knight Bus scene from Harry Potter and the Prisoner of Azkaban! Like Pam, I'm a huge Harry Potter fan so I was super excited about this collection! For each polish, I've included Pam's description in italic text then my comments after. Please see the end of the post for release info and a discount code! A buttery, blue-leaning purple that is a nod to the emergency transport vehicle itself! Creamy formula is opaque in 2 coats. This is a gorgeous, extremely smooth and buttery purple. Purple is my absolute favourite colour and know already that this is going to be a favourite in my stash! Flawless formula and application. It's a tricky colour to photograph so I've included a few photos for you to get a good idea of what it looks like. I used 2 coats plus topcoat but it's really shiny on it's own. What ‘Choo Fell Over For? Did you see the beautiful, dark, glistening asphalt that Harry planted his buns on when the Knight Bus appears out of nowhere? My goal was to recreate that in this polish. A dark grey creme base that is packed with white, blue, and purple flecks. Slightly sheer on the first coat, it builds nicely in 2 or 3. Paint Box Polish - What 'Choo Fell Over For? This is a really original polish in my collection. I love the blue and purple flecks against the grey base. A lovely 'neutral' with a bit more to it. I used 2 coats and topcoat. Formula and application were also great. Won’t The Muggles See Us? This film is saturated with varying shades of blue and grey. This polish is a nod to that. The palest blue is peppered with grey and violet flakies and highlighted with white and blue flecks. Opaque in 2 coats. Paint Box Polish - Won't The Muggles See Us? This is a lovely pastel creamy polish. I love light coloured polishes with flecks and flakies! formula is a little thicker than the others but that is to be expected with such a light colour. The application was just as easy though. My first coat was a little patchy but everything evened out with the second. I loved this one so much that when I finished swatching, I put it back on as my full mani! One of the few places in this film with a warm feel is The Leaky Cauldron. It’s polish is a dusty, warm, dirty orange with linear holo and fiery, copper flecks. Kinda like the tavern itself. (But we took some liberties with the rainbow holo thing). This squishy polish is opaque in 2-3 coats. A really unique dusty orange that feels very autumnal. A nice change from the vivid orange polishes that make me think of halloween more than anything else. This one feels wearable and perfect for the season. I love the squishy texture which is pretty unusual with holo polishes! Formula and application, like the others, were good. I used two coats plus topcoat. Again, I've included photos in different light for you to get a better idea of the colour. A blend of organic apricot kernel, sweet almond, jojoba, and vitamin E oils. It absorbs quickly and provides exactly the right moisture to strengthen nails, prevent peeling, and add needed flexibility. The scent is a pumpkin-based combination that also refreshing and fruity! You may already know that I'm a big fan of Pam's cuticle oils (and mani fizzies too). The Pumpkin Juice scent is so fun and is the perfect addition to a Harry Potter collection! Genius! This scent is exactly what I imagine the pumpkin juices of the Hogwarts Express smell like! This cuticle oil is very moisturising and absorbs well. The scent isn't too heavy or too light and lasts on your skin for a while. I love it. This was my first time trying the brush pen applicator and I have to say, I'm a fan. It is very practical for application because it allows you to get exactly the right amount of product right where you want it and its good for carrying with me in my handbag. I also wanted to mention the new fan group on Facebook called Paint Box Mani Mafia. We’d love to have you join if you haven’t already! We share info there first, and there may be see giveaways and group customs in our future!